The pArchive utility is a simple graphical front-end to archival and file compression formats frequently used in the Linux desktop environment. In addition to availability in the standard Puppy XDG menu, the built-in creation, extraction and viewing modules are accessible as separate right-click menu options in ROX-Filer and Thunar. From the right-click context menu you can create or extract archives as usual, or conveniently manage them without manually extracting them first. That is, when the 'manage' option is utilized, the archive is automatically extracted as a background process and you can transparently access the contents with a filemanager and quickly extract individual files or add new files to the archive if you wish. A detailed help file is included in the pArchive package. • Create, extract or view 7z, bz2, gz, lz, lzma, lzo, xz and zip compressed files. • Create or extract Bcrypt (bfe) compressed files. • Create, extract, view, edit (and update) 7z, pet, sfs, tar, tar.7z, tar.bz2 (tbz2), tar.gz (tgz), tar.lz (tlz), tar.lzma (tlzma), tar.lzo (tzo), tar.xz (txz) and zip archives. • Create, extract or view iso archives and Bcrypt (bfe) compressed archives. • Extract or view apk, cb7, cbr, cbz, jar, deb, rar and rpm archives. In pArchive, creating pet packages with xz-compression requires a recent Puppy dir2pet script with xz support (ex: Slacko Puppy 5.7/6.0). Installing an xz-compressed pet requires a recent Puppy installpkg.sh script with xz support (ex: Slacko Puppy 5.7/6.0 & tahrpup 6.0 CE). - Auto-adjust width of GUI widgets to accommodate long non-English text strings. - Bugfix: right-click direct extraction of 7z archives. pArchive-1.0 is already gettexted (except the help file). If you have corrections or additions to the current gettext, I will include them in the next official release. pArchive-1.1 will be available soon (in a few days). I'm on vacation in a few days. I'll try to quickly provide a translation fr. Please enjoy your vacation first! pArchive-1.1. See first post above. First version of the FR translation (.mo and .desktop). It is not perfect, but it is usable. Your translation is very much appreciated! don570, thanks for your recent helpful comments and alternative code. their buttons can be narrower or the same as English. ... I've been working on the Chinese language recently and I noticed that Chinese (and Korean ,Japanese) just use a few picture characters to replace an English word so their buttons can be narrower or the same as English. Would the translated button text always appear as abbreviated character strings (without exception)? If so, the next release of pArchive will use the same button-width for the English, Japanese, Korean and Chinese languages. or Slacko (pfix=ram) according to my instructions. There's only two pet files that have to be installed. Here is the translations that icake sent me. 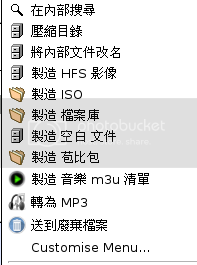 The next release (pArchive-1.2) will be available in a few days, including support for abbreviated text strings of the Japanese, Korean and Chinese languages.